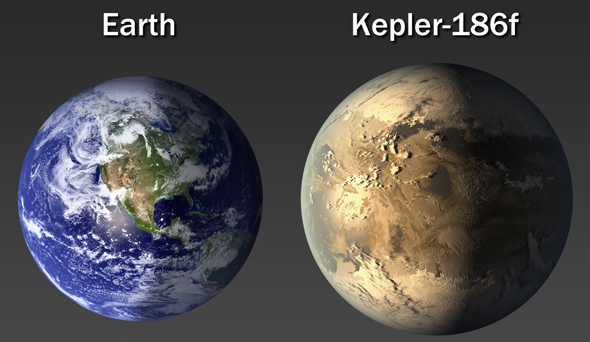 Size comparison of Earth and Kepler-186f. Credit: NASA Ames/SETI Institute/JPL-CalTech. The Kepler Spacecraft’s primary planet hunting mission has ended, but the data it generated will keep astronomers busy for years to come. Today, NASA announced that it has found in that mountain of data, Kepler’s first truly Earth-sized planet in the “habitable zone” of its star. Kepler-186f is one of five planets in its solar system, all of which are pretty close to Earth-sized. Kepler-186f in particular is only 11% larger than Earth. Unfortunately, the red dwarf star it orbits is too dim to look at its spectrum to get a good mass measurement, but a planet that small is very probably rocky, at least according to current theories. Of course, our theories about exoplanets have historically been more wrong than right, so who knows. But the real problem with Kepler-186f is that it only receives one third as much sunlight as Earth does–considerably less than Mars. Now, Mars is a lot smaller than Earth, so a bigger planet, able to hold on to a thicker atmosphere, having strong enough greenhouse effect might still be able to support life, but I am highly skeptical.The hard part is figuring out whether this planet falls in the “habitable zone“, the correct distance around the star where it could support life. Why the scare quotes? Simply because nobody can agree on where the limits of the habitable zone are. In the past few years alone, various estimates have placed the inner edge at anywhere from 0.5 to 0.99 times Earth’s distance from the Sun (corrected for the brightness of the star) and the outer edge at anywhere from 1.02 to 2 times as far. So habitable planets may wind up all over the place or fall in a very narrow range of distances. The contention at the inner edge has to do with how much sunlight (not heat per se, but more visible and ultraviolet light) is needed to either evaporate water from the upper atmosphere and get rid of the oceans, and/or trigger a runaway greenhouse effect, like on Venus. There are some theorists who claim that, thanks to the gradual brightening of the Sun over billions of years, Earth is just barely habitable, and just a small increase in temperature will push it over the edge. Personally, I don’t buy this, since the climate did get a major nudge in that direction in the Paleocene-Eocene Thermal Maximum, just 56 million years ago, with no long-term ill effects, not to mention the other estimates of a wider habitable zone. I have to wonder (and I know I’m not the first to do so) if some of these strict models come back saying that Earth itself is not habitable at first, and they have to be corrected to make it fit. The outer edge of the habitable zone depends on how far out you can put a planet and still warm it up with the greenhouse effect enough to have liquid water. This is also a complicated question, since we don’t understand planetary atmospheres enough to know how much greenhouse effect is realistically available. Worse, even if a planet falls in the habitable zone, it could still be completely frozen over, just like Earth is believed to have been several times in the past. Indeed, some models suggest that if enough of the Earth was covered in ice today, even with the amount of sunlight we get now, the oceans could freeze over. There may well be more than one stable climate for the same planet.So where does this leave the search for habitable planets? It’s hard. Most of the near-Earth-sized planets we’ve found, like Gliese 667Cc, are quite a bit bigger than Earth, and their densities indicate that that have deep hydrogen atmospheres, or at least enough water that there’s no hope of finding any dry land. In my opinion, the exoplanet we know of that is most likely to be the right temperature and rocky is Kepler-62e. It’s a little on the warm side, and it might still be a waterworld, but it’s the best we’ve got.The fact of the matter is, we only just barely have the capabilities to detect Earth-like planets at all yet, so it’s not surprising that we haven’t really found any that are convincing. The good news is that in another 5 to 10 years, that could change dramatically as the next generation of telescopes come online. It’s still an exciting time to be a planet hunter. This entry was posted in Current events, Planets and tagged earth-like planets, earth-sized planets, habitable zone, kepler, kepler-186f. Bookmark the permalink.